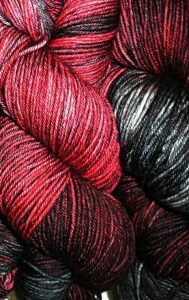 Generally I dye solid or near solid or solid-ish yarns. There’s a good reason for this. I love intricate stitches. Cables, lace, nupps, you name it. I hold that a busy yarn muddles the things and often hides the effort put into these elaborate stitches. On the other hand – or foot as the case may be – a crazy sock yarn knit quite simple can be a great deal of fun. This week I spent much of my studio time dyeing crazy busy sock yarn. These colorways are not up on the website yet – but if you see us at Fiber Christmas in July, Stitches Midwest or Mid-Ohio you’ll be able to snap them up in person. 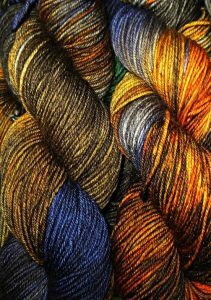 I had a blast working on these new yarns, and found it quite yard to keep from snagging one or two skeins for my own stash. 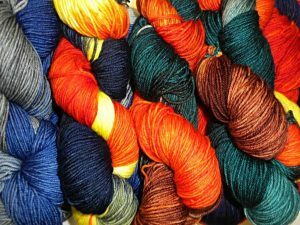 In fact, I wound a skein of teal, maroon, and bright orange and brought it back to the house. 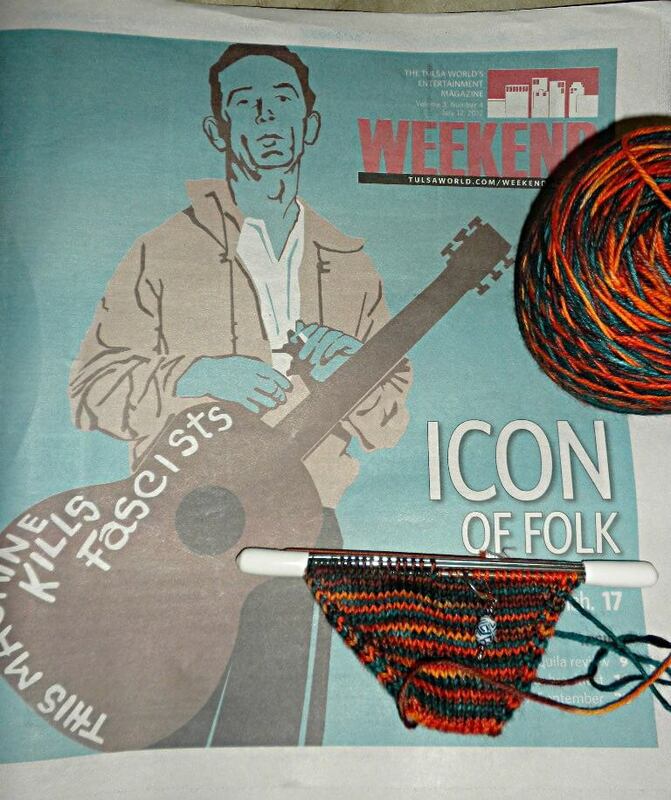 If you’re looking at that sock you may be saying – “hmmm that sock looks a good deal wider than the socks Denise usually knits”. The sock is wider – because it’s not for me. Chris is going to love these. It’s blazing hot out and a crazy sock is about all I can manage in this heat. (currently 90F and noon) This weekend we’re driving over to Okemah, Oklahoma. Tomorrow will be the 100th birthday of Woody Guthrie and we’re going to WoodyFest to celebrate. WoodyFest is one of our favorite Oklahoma festivals. Folk music fans flock in from all parts for this free festival held each summer in Woody’s hometown of Okemah. During the day when it’s too hot to breathe and your brain can sizzle and smoke if you’re outside too long the best music around can be found on the basement stage of the Brick Street Cafe downtown. Just after the dinner hour (despite the fact that it’s still hot enough to parch your throat in two minutes flat) the music kicks up out in the Pastures of Plenty. Sure there are headliners like Melanie and Judy Collins. But who we go to see are the fabulous talents that are Okie-grown. A young man that we’ve been following since the first time we saw him at WoodyFest six years ago is John Fullbright. If you’re an NPR listener you’ve possibly heard reviews and interviews with John in the last month or so regarding his new CD From The Ground Up. It’s been crazy warm here too – I’ve been making great sock progress!